SUMMARY: A young girl with the ability to communicate with animals is asked to help a large white bear in an ice palace. The ice palace and all its inhabitants, including the bear, are under a troll princess's curse. REVIEW: This book is based on a Norwegian fairy tale similar to "Beauty and the Beast" and to a lesser extent, "Snow White and Rose Red." I liked this book okay, but I'm not jumping out of my chair over it. The female protagonist is the youngest of 12 children. Because she was unfortunate enough to be born last and female, her mother never bothers to give her a name. I never understood why no one else in the family (particularly her father or oldest brother) ever gave her a name, especially since the nameless were at risk of kidnapping by trolls. Anyway, the family calls her the pika, or little girl, and her oldest brother calls her "lass." When she is about nine years old, the pika saves a white reindeer from hunters and is blessed with the ability to talk to animals. This serves her well until one night, an ice bear wants the pika to come live with him for a year and a day. I thought the first half, where the pika's character and her family dynamics are being set-up, was much more interesting than the second half. This is a very large, very poor family, and the mother especially is someone readers will love to hate. She's not evil, but she is pretty horrible to the pika. The mystery surrounding the oldest brother Hans Peter was also interesting and well-written. 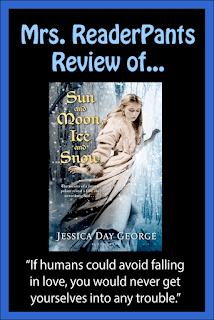 I loved the winter wonderland setting throughout; George's descriptions of the winter landscape made me feel like I was right there. While I enjoyed the first half, I lost interest in the second half, where the pika lives in the ice castle. There isn't much going on in the castle. The pika eats, talks with the bear, tries to read the troll carvings, asks too many questions. But from day to day, not much happens beyond the mystery of what's going on with the troll curse. I also never felt connected to the bear and felt the romance lacked chemistry. THE BOTTOM LINE: It's okay. The first half is better than the second half. STATUS IN MY LIBRARY: We have it. I booktalked it last week with a class, and one girl put it on-hold for when I finished.